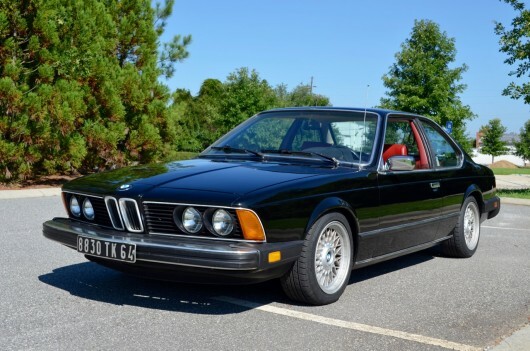 Found here on eBay is a very original 1978 BMW 633csi. This shark-nose 6er wears its original Schwarz black on Veloursrot red color combination. The car was repainted in the last five years and the paint looks good. Inside the front and rear seats have been recently recovered and they are in like-new condition. The 3.2liter straight six starts easily and runs great. There is a small oil drip that only shows itself after the car has been sitting for about a week. Other than that, everything is dry underneath. Recent engine work includes a tune up, oil and filter change, new air filter and new belts. On a recent trip to The Vintage BMW show outside Asheville, NC the car ran flawlessly and was a blast to take through the twisty mountain roads. Sixteen inch basket weave BMW wheels are shod with brand new tires and B&G lowering springs have been added to a new set of Bilstein shock absorbers. The original springs are included with the sale in case the next owner would like to put it back to the stock ride height. Inside, all of the heater, blower fan, Alpine stereo, front power windows and gauges function as they should short of the odometer. The previous owner claims that the car has roughly 75-100k on it, which is consistent with the wear present. The passenger side rear window works well however the driver’s side window does not. The sunroof works using the manual crank in the trunk but the electric switch has gone out. The headliner is a bit tired and the dashboard is cracked which is common for e24’s. Georgia is a no-title State for cars 1981 and older. The previous owner lost the original title for this BMW and Georgia does not issue new titles for old cars. Instead, a VIN check was processed by the police department that came back clear and the tag issued on that. The car will be sold on a bill of sale only. For states requiring title for registration I will provide a tag receipt, letter from the State of Georgia and Bill of Sale. This is a great first generation 6 series grand tourer that loves eating up mile after mile with ease. Feel free to email with questions or to arrange a time to see the car.